The Trump administration announced on Monday that nearly 200,000 people from El Salvador who have lived in the United States for more than a decade must leave the country. The administration is giving the immigrants until September of 2019 before they could face deportation. 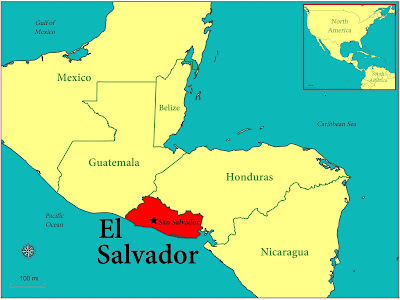 The immigrants from El Salvador were part of the humanitarian program—Temporary Protected Status. This program allows immigrants from designated countries to live and work (and pay taxes) in the U.S. without fear of deportation. The program was created by President George Bush in 1990, and immigrants from El Salvador were included after devastating earthquakes in 2001. 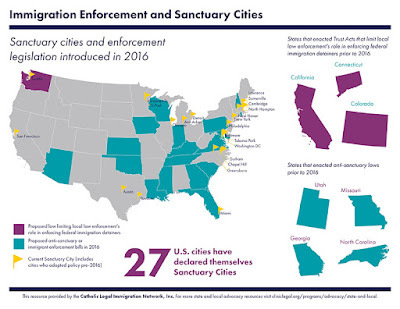 Over the next 15 years, President George W. Bush and President Obama extended the protection status. 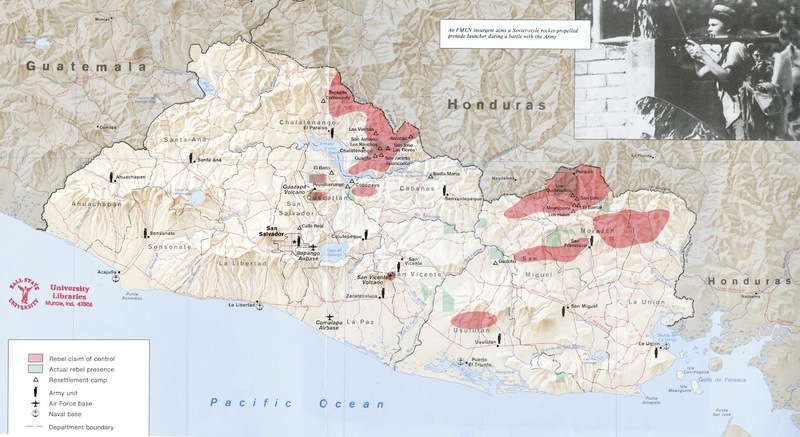 The Ball State University Libraries GIS Research and Map Collection (GRMC) includes a unique collection of maps of El Salvador. The map above (top, click to enlarge) is called El Salvador: The Struggle for Rural Control and was published in 1991 near the end of the country’s 13-year civil war. 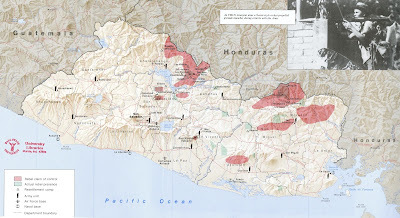 The map identifies areas controlled by the rebel group, the Farabundo Marti National Liberation Front (FMLN). The red- and green-shaded areas depict areas under the control of the FMLN. And government army units are shown with the soldier icon. 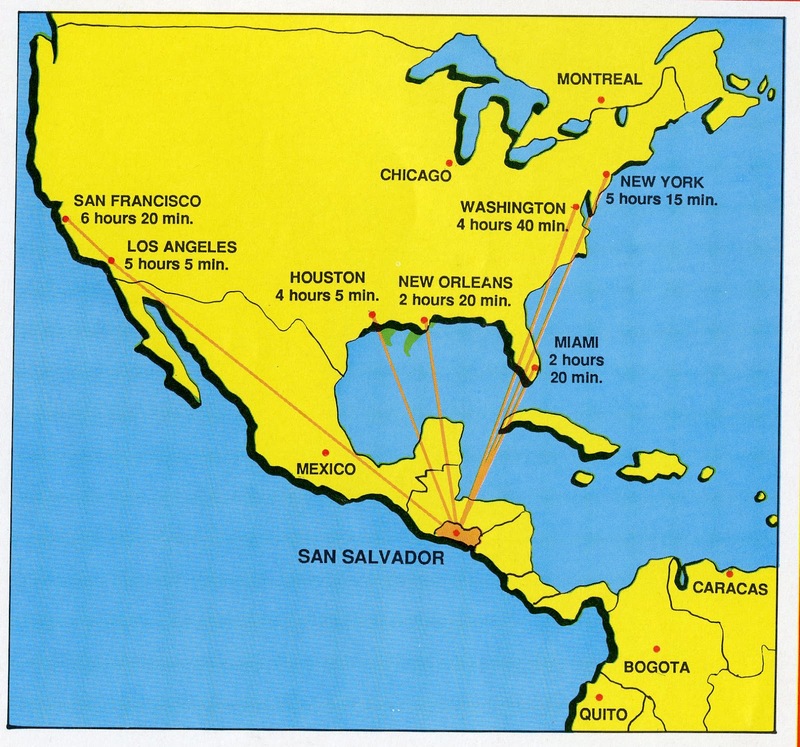 The GRMC also includes ortho-photographic maps of El Salvador at a scale of 1:5000 meters (above). These maps identify important buildings in red, railways with the black line, and main roads with a red line. The maps were published by the National Geographic Institute of the Ministry of Public Works in Sal Salvador. The tourist map (above) identifies the locations of Pre-Columbian ruins and historical sites, skiing and fishing areas, and beaches throughout the country. 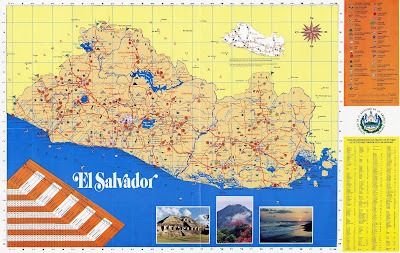 El Salvador’s numerous volcanoes and mountains are also depicted. 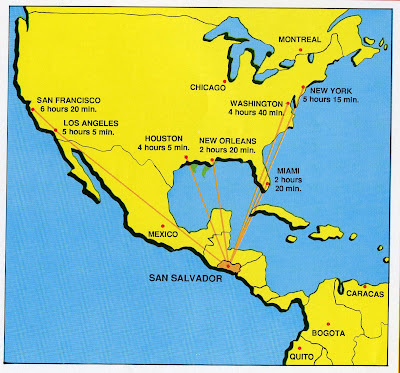 The map was published by the El Salvador Tourist Commission and also includes an inset map showing travel times to U.S. cities. The GRMC also maintains a repository of digital maps related to current events and social topics that may be used as visual aids for research papers and learning projects. The map, Immigration Enforcement and Sanctuary Cities, was published by the Catholic Legal Immigration Network in 2016. 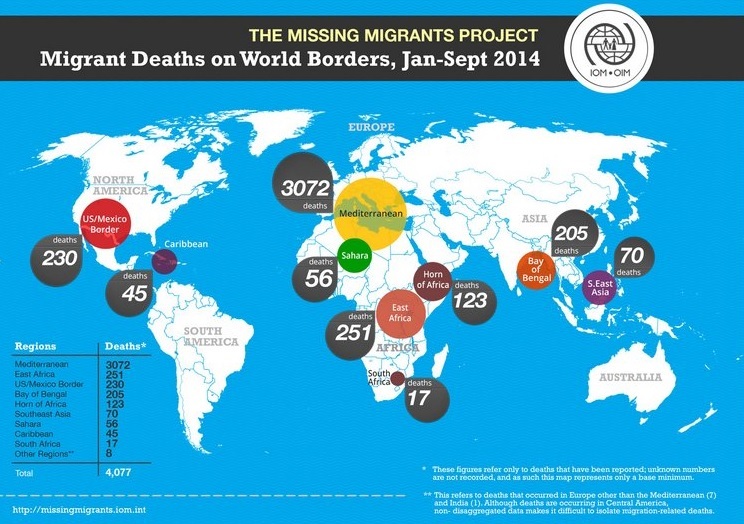 The Missing Migrants Project published the map showing migrant deaths on world borders from January through September 2014. Migration Policy Institute’s Data Hub includes maps showing the U.S. immigrant population by state and county, maps related to the Deferred Action for Childhood Arrivals (DACA), and top immigrant populations by state and cities. 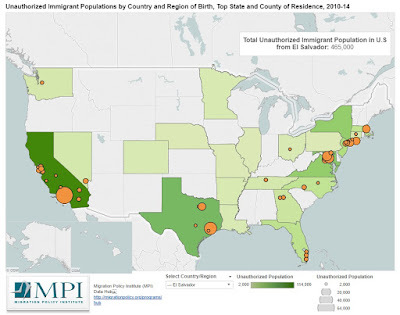 The map above identifies where most of the immigrants from El Salvador are located in the United States. 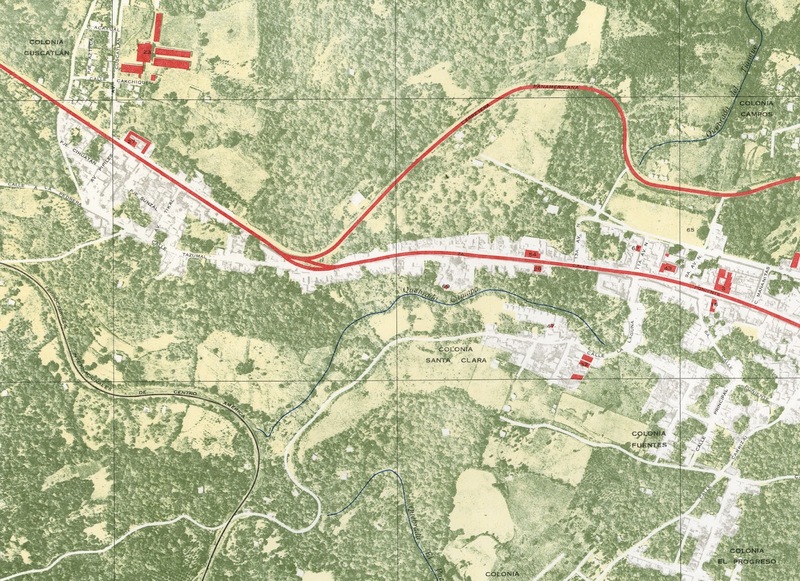 The digital collection of maps also includes large-scale maps that can be printed using the plotters in the GRMC, or the maps may be projected digitally for presentations. This collection also includes posters that can be used for presentations about specific countries. For more information about the maps in the GRMC or using maps as visual aids in research and learning, please contact Melissa Gentry at 765-285-1097.